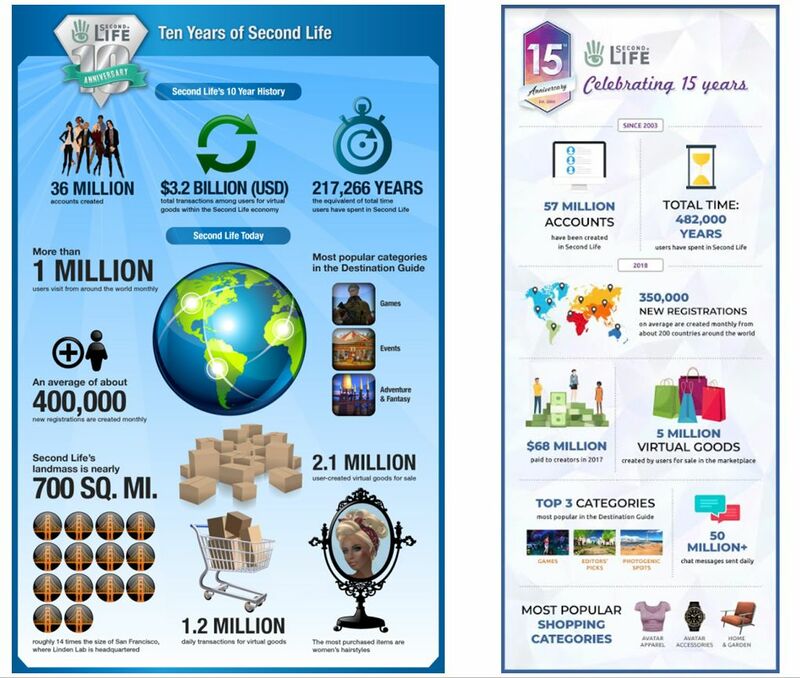 On Monday, April 23rd, Linden Lab issued an infographic on the state of Second Life as the platform approaches its 15th anniversary. The last time the company did this was, I believe, for the platform’s tenth anniversary in 2013. Both infographics obviously offer a potted view of Second Life which some might choose to take as spin – but casting the platform in a positive light is what PR is about. More than that, when all is said and done, the figures do go some way to showing the platform is still a vibrant place with a healthy economy and a (broadly speaking) positive engagement on that part of active users. The “spin” element might be seen in elements such as the number of accounts created in Second Life: a total of 36 million between 2003 and 2013, and a further 21 million in the last five years (for a total of 57 million since 2003, when SL formally opened its doors to the public at large). These figures sound impressive, but when push comes to shove, “accounts created” is a pretty meaningless figure. What really matters is the number of active accounts operating within Second Life; and the fact is that over the years these have been dropping – perhaps not by the amounts some might think – although it is admittedly hard to pin things down to a precise figure. Similarly, the number of new user registrations (400,000 reported in 2013 and 350,000 reported in 2018) doesn’t add up to a major indicator of SL’s health – but, in fairness nor do they indicate any kind of major decline, despite the 50,000 drop over the intervening period between the two infographics. But really, the issue with Second Life is not the number of sign-ups achieved, but the number of retained active users the platform obtains. Side-by-side: the 2013 (SL10B) and 2018 (SL15B) infographics. But how useful are they? Perhaps of more value, to a degree, are figures like the total hours users have spent engaged in the platform. in 2013, this cumulative total for 10 years was stated as an equivalent of 217,000 years; for the 15th anniversary it is put at 482,000 years. What these show is that while the number of active users engaged in Second Life may have shrunk somewhat (notably since its peak in around 2008), those still engaged in the platform are between them potentially spending more time logged-in to the platform than they were five years ago. Why this might be is open to speculation; but one group of reasons could be that the time an effort Linden Lab has put into improving the overall Second Life infrastructure, making batter use of technology, improving the performance of much of the platform (simulators, back-end systems, etc. ), and the work put into enhancing user-facing capabilities, which have collectively encouraged people to spend more time in-world now than five years ago. This increase in time spent engaged in the platform has other potential benefits as well – such as in increased economic activity. This is somewhat indicated by the 2018 infographic, which indicates that Second Life creators and land holders cashed out some $67 million in 2017. During sessions such as Lab Chat, and other public meetings, it had been indicated that the amount cashed-out by users in 2015/2016 was around $60 million; so it would seem that overall, the SL economy is experience an upturn, albeit a modest one. The strength of the economy might also be indicated by the rise in the number of virtual goods for sale: 2.1 million in 2013 and a stated 5 million in 2018 – although I point to this increase with the caveat that items for sale doesn’t necessarily translate directly into increases in goods sold. Given that the 2018 infographic would tend to indicate overall engagement in the platform among engaged Second Life users has increased, the economy has apparently undergone something of a growth as well, it’s perhaps understandable why – as per the recent town hall meeting – there is now a much stronger emphasis within the Lab to pro-actively try to grow the user base going forward – and some interesting approaches are being tried. So, what of the issues of active user numbers and new user accounts? It is true that Second Life is experiencing shrinkage in the number of active users. However, a degree of perspective is required when discussing it. At its peak in around 2008, SL averaged around 1.1 million active monthly log-ins. Today, it is lower – but by how much? That’s a tough nut to crack. One of the few sources of real data we have comes from the SL Statistical Charts Page put together many years ago the most respected Second Life blogger (whose insight is genuinely missed), Tateru Nino, which is still active today. Among other things, it provides a series of breakdowns of concurrent log-ins – current and over set periods of times. These tend to collectively show that by-and-large average concurrency is between 30,000 and 50,000. Even when taking the bottom end of this range as the daily “average”, it still yields around 900,000 active monthly log-ins. That’s just 200,000 from the platform’s peak. Of course, it might be argued that some of these concurrent log-ins are alt accounts or possible bots and so “don’t count”. But how large a figure is that likely to be? It’s impossible to know. Some factor it as being more than one-third, which might not be a wholly unreasonable figure; however, a counter-point to this is that just because someone is logged-in on two accounts doesn’t mean they’re not actively contributing to things like the economy through both of those accounts; so while it might be argued such activities reduce the total user count, it may not negatively impact the platform’s economy. Similarly, and where there are no empirical numbers available, it is fair to say that bot usage today is a lot less prevalent than when SL was at its peak; thus while their influence cannot be completely discounted, they are likely to have less of an influence on concurrency today than a decade ago. The most interesting aspect of the figures is perhaps those of sign-ups As noted above, the Lab notes a decline in monthly sign-ups of around 50,000 since 2013. Looking at Tateru’s data for 2011 (the nearest 6 month period to 2013 I have archived) and 2018, shows the average daily rare of sign-up hasn’t varied overly much across the years – although arbitrary daily figures can show more of a variation. Both the infographic and Tateru’s stats would again point to the Lab’s optimism around growth, indicating as they do that while daily sign-ups have dropped somewhat over the years – Second Life potentially still generates interest, not all of which can be put down to existing users creating thousands of alt / bot account daily. The problem is, as noted earlier, getting more of those sign-ups converted to active, retained users. Overall, the current infographic reveals that while there is undoubtedly room to grow the numbers of active users, and despite the downplaying of monthly active users by some, Second Life is still a healthy platform for both users and the Lab when it comes to generating revenue – and the weight of virtual goods tends to point to the Lab’s hopes to re-balance their own revenue generation away from such a heavy reliance on land tier as having merit. More to the point, it does demonstrate that, despite all the fears about the arrival of Sansar, etc., as Second Life approaches a celebration of it’s fifteenth anniversary, it still offers a richness and depth that can keep us all engaged with it. One big question is what the next new thing to drive consumer demand will be. In the recent past, a lot of buying has been fueled by the switch to mesh bodies – not just the bodies themselves but also the new wardrobe to do with them. Eventually we will reach the point where everybody who wants one already has one, so some new factor will be needed to keep sales from declining. Assuming all goes well, there are two major projects on there way which could shake-up the consumer market: Animesh (which could have a wide range of applications) and Bakes on Mesh (although overall, it’s hard to tell how pronounced the initial impact of this will be, as what’s likely to be in the initial iteration is possibly still open to debate / change).